An elegant presentation with a variety of cheese, nuts, smoked salmon, savory snacks and Belgian Chocolates. An elegant presentation with a variety of delicious foods everyone will enjoy for every occasion. 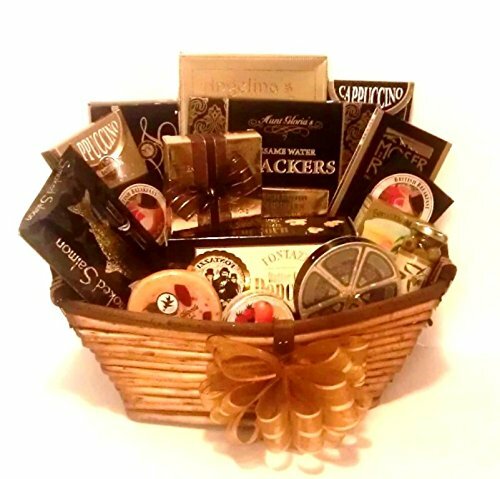 Features Brie & Cheddar Cheese, Smoked Salmon, Olives, Fruit Bon Bons, Mixed Nuts, Smoked Almonds, Hazlenut Caramels, Belgian Truffles and so much more in an elegant keepsake wooden wicker basket. Wrapped with clear cellophane, occasion ribbon and your gift message card. Simply an exquisite basket with substantial portion sizes.